Hi I have Dffinity Photo and just bought Affinity Designer aswell for work purposes. But the designer app keeps crashing when i try to launch it. ​The strange this is that if i open a file in "Designer" it does NOT crash. 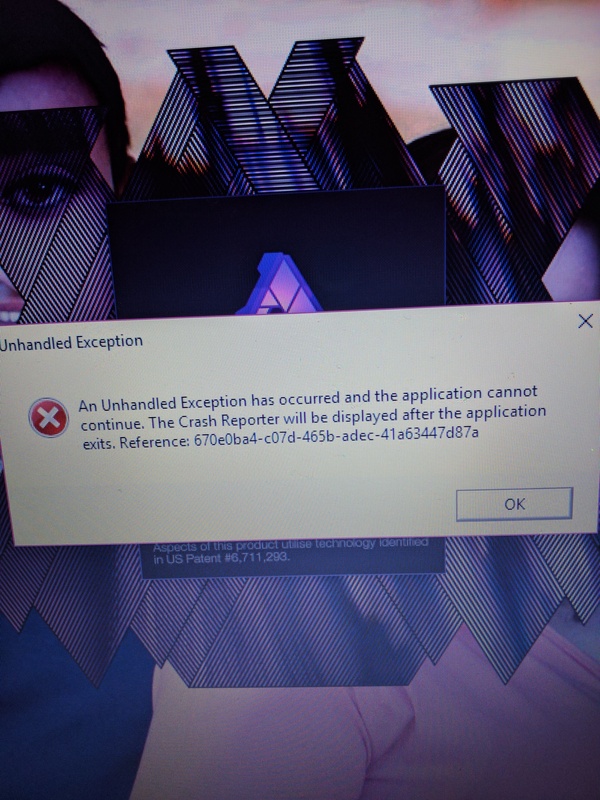 ​An unhandled exception has occured and the application cannot continue. Thanks but this does not work, because the file is not there. The app also keeps crashing when i use restrictions in the app. Thanks the program now works fine when launching. But still some of the unexpected crashes when using constrains does bother me. I aslo have had to reduce the amount of ram Affinity Photo is allowed to use to keep is from being more unstable. Allowing it to use all my 4gb of ram was not a good solution. but scaling it down to 2 or 1gb fixed the problem. Just something u might look into on future updates. I have this problem too. I just purchased designer yesterday and i have not gotten it to start up yet. I dont thonk that i should have to do workarounds on a fresh install. I'm using an external ultrawide 2560x1080 Acer display. Maybe that resolution might trigger it somehow? I am getting same error when launching my new updated version of Affinity 1.6. I just updated the software from 1.5 to 1.6 yesterday. The previous version was launching without any glitches. I have rebooted my computer and still problem persists. Thank you. The easiest workaround i found is just to choose "open with Affinity" on any supported picture or document type. This thread that you have replied to is 9 months old, so it the discussions apply to an older version. When you get a crash, do you get a crash reference dialog? If so, attach a screenshot here and I can take a look. Mark, this was just most relevant topic yes I will attach screenshot in an HR after work. Thank you! As promised, here is a picture of a crash report. Thank you for your input! Thanks for the picture. It looks like the crash report hasn't uploaded yet. Can you take a look in the following folder for me, and attach the report to this thread? Hey, I just purchased this program after trying the trial version and have been having the same issue. Actually worse, because even after implementing another fix to paste the provided file, it would just crash when I tried to click on a menu or click on anything, for that matter. Welcome to the Serif Affinity forums. You seem to have got yours working but the rest of this reply is just in case your fix is only temporary. The Windows version 1.6.3 was released on Thursday and has been found to crash for users with Huion tablet drivers. If this describes your situation then sorry. In the meantime you could install the customer beta, which is identical to 1.6.3 but with the tablet issue fixed. You can find a link to the download in the first paragraph of the top (pinned) post at the top of the Affinity Photo Beta on Windows forum and Affinity Designer beta on Windows forum. "Not for production" is normally a warning on how untested it is (so take care editing precious files), not what you may do with it. The "not for production" message for 1.6.4.104 (so this specific case/build) is not to be worried about because the software is identical to the release build with the exception of the Huion issue. Same issue - downloaded Affinity trial today (I wanted to test it out), and got this crash when starting Affinity - and nothing seems to help (no reboot, no deinstall and reinstall, no cleaning of the ProgramData\Affinity\Photo\1.0). I am on 1.6.4.104 (test). Also get the crash report window and send it. Using "open with ..." on a jpeg file in the explorer however works fine. btw: after more searching in the forum, I got a hint to check the %APPDATA%\Affinity\Photo\1.0\user\ directory for the macros.propcol (and to delete it). This didn't help. But after I renamed the whole %APPDATA%\Affinity\Photo\1.0\ directory, Affinity starts again without an error and creates a fresh new directory. I get only a few differences - in text (unencoded) files, changes are in Export.xml, PhotoshopPluginsPreferences (here I had added Google NIK collection - a potential source? ), RecentFiles.xml (guess uncritical), Schemes.xml, Window.xml, Tools.xml, WindowProfile.xml. Does it makes sense to look into it deeper? Hi @justus, thanks for investigating this. We would be interested in receiving a copy of your %APPDATA%\Affinity\Photo\1.0 old\ folder so that we can investigate here. Do you still have it? It might be Window.xml or WindowProfile.xml that was causing the problem. If you perhaps used your old folder again, but deleted those XML files, one at a time, that might reveal the problem. Hi, I copied the files over one by one - the crash is caused by Window.xml (WindowProfile.xml did work). The difference to the default window xml is in the position/size of the affinity window. assume that <Display>0</Display> is my first display (laptop) and <Display>1</Display> my second disply (monitor). the behavior is, that the affinity window opens first for a moment on my second display, then it is automatically moved to the first display, and then the crash window shows up. my first display has 3840x2160 resolution, my second 2560x1440. Yes - that's excellent thank you. With this we should be able to reproduce the problem. Just to make sure - when the crash happens, you still have both monitors plugged in? Do you unplug at any point? otherwise (1) open affinity, (2) don't move the affinity window, (3) close it, (4) open it again and all fine. can you reproduce it as well?